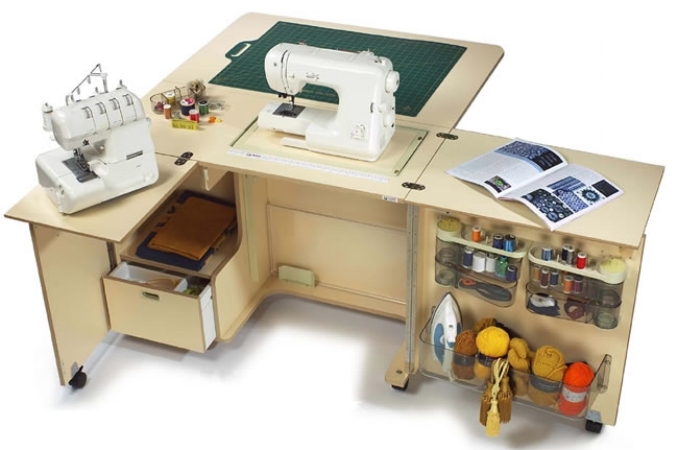 Sewing cabinets, tables, and studios make sewing easier. Your sewing machine is at the right ergonomic height. Also, many cabinets have storage options which help organize your sewing supplies. There are dozens of different cabinet models in a variety of finishes. That's why we custom order cabinets. Most cabinets take a week or less to come in. Some manufacturers will ship the sewing cabinet right to your house! TO START SHOPPING, click on the cabinets below to go to that manufacturer's website. If you see something you like, stop in or call us for a price. If you see something you like elsewhere that isn't shown here, contact us. We are at or below Internet prices! Remember, we match prices! Available in white or teak, the Tailor Made Gemini is a VERY high quality cabinet that features a back leaf, 2 side leaves, storage boxes and trays, room for fabric and books, spacious leg room, a foot rest, a heavy-duty German lift mechanism, heavy-duty locking caster wheels, snag-free hinges, and more. Just 30.3 inches wide when closed. Machine opening is 20.25” wide and 10.5” deep. Call or email us if you are looking for a particular model. Our line up changes frequently. We just may have it in stock. We are at or below Internet prices. If you find a lower price, we'll match it! Questions? Contact us. * Savings based on MSRP, competitor's price, or what we establish as the overall value of the unit compared to comparable products. Not responsible for website errors or omissions.